Hello from Davos, Switzerland. We spent the week at the World Economic Forum, the annual gathering of world leaders, bankers, executives, activists and celebrities. The Axios Davos squad is made up of Steve LeVine, Alison Snyder, Dave Lawler, Eli Sinkus and Jimmy Shelton. For two years, the global elite fumbled for ways to defend the seven-decade-old structure of trade and diplomacy from punishing attacks. This week, top players declared the system all but dead. The main thing now, leading thinkers said, is to try to ensure that what replaces the system in the coming years prevents great-power war — as the existing one has — and delivers more for millions left behind by the current economy, Steve reports. The scale of what comes next seems likely to rival modern social, political and economic transformations, such as the post-Gilded Age of the early 1900s, the global Great Depression of the 1930s, and the Reagan-Thatcher revolution of the 1980s. "The paradigm is shifting. Powerful people are asking questions on the record in the halls that they've never asked before," said Ben Pring, director of the Center for the Future of Work at Cognizant. 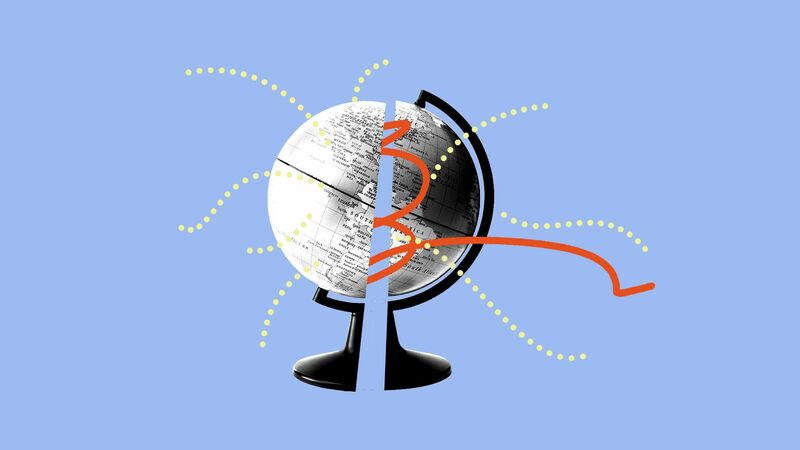 Politicians, executives and scholars told Axios that, while the current system is still functioning, a transition is already under way to what's likely to be a very different global political and economic order, one that is now — at best — faintly visible. Klaus Schwab, founder of the World Economic Forum, told attendees that they must make dramatic changes to the global system, and not merely tinker. And executives seemed to agree, voicing a new readiness to fundamentally change course in order to avert the worst. One thing all of them told us: The speed of advanced technologies, in particular artificial intelligence and automation, is already making the transition more disruptive than prior epochal shifts — and may prolong it. Brian Gallagher, CEO of United Way Worldwide, who has attended Davos 10 times, said: "They understand that they may have to slow down the integration of the global economy in order to let the rest of society catch up. That's the first time I've heard it here." The new order could enable authoritarian-style governments that undermine counterweight institutions, said Adam Tooze, an economic historian at Columbia University. "You could have a liberal trading system with a majority of authoritarian regimes." Many assume Beijing will sooner or later dominate the new order. That is not preordained, but even if power is dispersed regionally, China, India and Brazil all stand differently politically, which could cause tensions of their own. If a single theme ran through the week, it was acceptance that the capitalist system, of which the attending elites are the masters, is broken. What brought them to this point is a growing threat of trust-busting, regulation and public opprobrium in both the U.S. and Europe, on top of the still-jarring Brexit and Trump votes. "Only 1 in 5 people say the system is working for them," Richard Edelman, CEO of the eponymous public relations firm, told Axios. "One in 3 say their children will be worse off. That is really scary." Real pay for all but the richest people has been almost flat for at least three decades. And when Americans have lost a job, nearly half have moved to a lower-paying one, jeopardizing their place in the middle class. This isn't an easy discussion to have: Executives, economists and others here were often angered at the mere juxtaposition of the words "capitalism" and "challenge," as though change meant a Soviet-style economy. But in public and private sessions, the CEOs came to acknowledge that few are talking about overturning capitalism itself, and determined that they must do something. Here's a chance to step into the goings-on, produced by Eli and Jimmy. Joint global efforts are finding it harder to win general support at the moment, but a nearly 20-year campaign to vaccinate children around the world was described as a success story here, Alison reports. The good news: Since launching in Davos in 2000, Gavi — a nonprofit that sells subsidized vaccines to the world's poorest countries — has helped to immunize some 700 million children against polio, cholera, measles and other diseases. By Gavi's calculations, that has helped avert 10 million future deaths. The number of children who die under the age of 5 has dropped by 58% since 1990, in part due to such immunization campaigns. Migration and growing economic inequality will leave some of the world's poorest and most vulnerable living in middle-income countries — which disqualifies them for most aid. That will make it difficult to reach those children, Gavi's CEO Seth Berkley told Axios. The big picture: Gavi and other global health initiatives depend heavily on funding from the U.S. and bilateral organizations. "In a world of populism, there is nervousness about whether it will get re-funded," said Novartis CEO Vasant Narasimhan. Traveling from the skiing village of Klosters to Davos may be faster by car. But the other option is the 7.5-mile, 27-minute journey by the Rhaetian Railway, an utterly breathtaking commute. Davos attendees were quick to point out that by many measures — health, safety, literacy — this is the best time in human history to be alive. Nonetheless, fear, anger and pessimism are all around us, even up here in the Swiss Alps, Dave writes. The big picture: We live in a society that incentivizes outrage and minimizes human contact, and it’s damaging our mental health, experts from Yale University told us. Yale President Peter Salovey cited a 2014 study from the University of Chicago on happiness. Asked their preference, people said they would rather be alone than speak with a stranger. Yet, the study said, research links such encounters with happiness — and tech developments like texting and online shopping are making them more rare. "A lot of things that gave us pleasure aren’t part of our lives anymore,” he says. Social media reinforces the idea that anger and outrage are effective tools to get that attention, said Molly Crockett, a psychology professor. Outrage on social media is “like a habit,” she said, and has blurred the line between acting out and commenting genuinely. By the end of the week, the procession of leaders had given an inkling of the world order to come, Dave reports. Tooze, the Columbia historian, told us: "We may have to get used to a more modest definition of 'liberal world order.'" That likely means removing liberal politics as a requirement to join the club. German Chancellor Angela Merkel said the "global architecture will only work if we are willing to compromise," accept a changing balance of power, and assuage "those who harbor doubts about the international system." Secretary of State Mike Pompeo, representing the U.S. via video link, argued that the "disruption is a positive development." International institutions can never "stand up for a people as well as their own leaders can," he said, and will only endure if pulled into this century. It fell to Vice President Wang Qishan of China, the main threat to the liberal order and a core factor in shaping whatever replaces it, to argue for an ambitious global system — on Beijing's terms. What's next: There will still be rules the major players can agree to. "You could have a liberal trading system with a majority of authoritarian regimes," Tooze said. But at this stage, the divided West is "not really in a position to go around postulating orders," he said, and even if it were, "China is simply not going to go along with it." Counterpoint: Other experts told us that ceding space to China is exactly the wrong approach, and that the West has to further assert itself. The bottom line: No one we met expects the world order to survive in its current form.